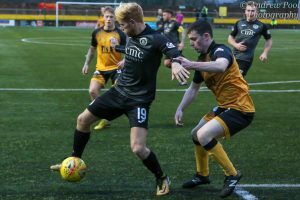 Annan faced a tough task as they welcomed league leaders Edinburgh City to Galabank on a miserable Saturday afternoon. Peter Murphy brought Chris Johnston and Lewis Strapp back into the starting line up in place of the injured Tommy Muir and James Creaney. It was also a debut for the new Assistant Manager Darren Barr. Annan started the match on the front foot, enjoying possession but without creating much in front of goal. Johnston looked lively after his recall to the team and in the 13th minute his cross was a little too high for Smith to connect and a clash of heads behind him briefly stopped play. Minutes later Johnston’s free kick needed punched clear by Antell in the opposition goal. In the 18th minute Moxon made space on the edge of the box to get a shot away but was hit straight down the middle for Antell to collect. At the other end Annan were let off the hook as Hoopers mis kicked clearance allowed Henderson the shot at goal but the ex Annan striker failed to hit the target. Annan continued to look for an opener, Wallace had a shot saved from a wide position and minutes later Wallace again got into a good position to get on the end of a Johnston cross but the header was again saved by Antell. Edinburgh rarely threatened in the first half but they struck a blow as half time approached. In the 41st minute Balatoni sneaked in between the Annan defence to head in a set piece from 5 yards out. It was a massive goal for the visitors at a vital time. It was Edinburgh who came out the blocks fastest in the second half and it took a fantastic double save from Mitchell in the 55th minute to deny Henderson and Taylor. A minute later City struck again as Liam Henderson fired the ball past Mitchell inside the box. The home side tried to hit back through Lewis Strapp but his well hit shot was saved well by Antell before Wallace had his effort flagged offside. Antell came to the rescue again for City as Aidan Smiths shot was saved by the right foot of the keeper. The Edinburgh goalkeeper seemed to have all the luck but it ran out in the 61st minute as he failed to collect the Annan free kick and it dropped nicely for Scott Hooper to smash into the net and give Annan a lifeline. Hooper had the chance to level the score in the 83rd minute but he scooped the ball over the bar from close range. Minutes later Johnston and Bradley both had shots desperately blocked as City held on. Lewis Strapp had one last attempt to level but blasted the ball over from 25 yards and the full time whistle was blown. EDINBURGH CITY- Callum Antell, Craig Thomson, Robbie McIntyre (Adam Watson 32), Conrad Balatoni, Mark Laird, Allan Smith, Blair Henderson, Graham Taylor, Gareth Rodger, Scott Shepherd, Liam Henderson. SUBS NOT USED- Freser Morton, Calum Hall, Luke Kennedy, Dean Beveridge, Regan Lumsden, Daniel Galbraith. Assistant Referees- Kylie Cockburn, Gary Hanvidge.